SCT1501 Series are replace of JST ZH connector. 1.5mm pitch, wire to board crimp terminal style with low contact resistance. The 1.5mm JST ZH Connector is compact, low profile connector commonly used in many servos, speed controllers and micro size receivers from consumer electronics to automotive, medical equipment and common household appliances. Scondar offers 1.5mm JST ZH connectors with circuits varying from 2 to 17, on which the wire ends may be pre-stripped and tinned ready for soldering. Enclosing this connector is a crimp style lock designed by Scondar and a special configuration which prevents users from inverted insertion. Scondar offers a variety of 1.5 Pitch connectors with different models and in various dimensions, with top or side entry configurations which might suit your specific needs. Top entry configuration consumes a minimum of 3.5mm x 5.6 mm mounting height and depth, respectively; while side entry configuration consumes a minimum of 3.7 mm x 7.1 mm mounting height and depth, respectively. In addition to the above flexibility in configurations of the 1.5 mm pitch connector, Scondar also offers this connector with different number of circuits ranging from 2 to 17 which would suit your specific needs. Reliable electrical connection, even under conditions of low current and low voltage, is guaranteed with its two point contact design. The ZH 1.5mm connector is completely compatible with ZR insulation displacement connector. The two solder tabs assure that retention of header to PCB connection and act as a strain relief for the SMT solder tails minimizing the chance of solder joints breakage. With its improved product enhancement, the connector has the capability of withstanding voltage of 500 V AC per minute, which means to say that the insulation is sufficient to protect the user from electrical shock, overheating and fire. The header contact is made up of copper alloy, tin plated over a phosphor bronze material. The housing is made of Nylon66 UL94V-0 natural ivory. These housings are available with or without protrusions. The wafer is made up of Nylon66/46 UL94V-0. The solder tabs are made up of brass, copper undercoated or tin-plated. These two solder tabs assure that retention of header to PCB connection and act as a strain relief for the SMT solder tails minimizing the chance of solder joints breakage. There’s a dimple at the center of the contact which ensures positive contact and low contact resistance at all times. Insulation resistance and contact resistance are of 100 M Omega per minute minimum and 20M Omega maximum, respectively. The temperature range for this connector is -25 degrees centigrade to +85 degrees centigrade. This range is based on the rise of temperature with increasing current. The 1.5 mm Pitch Connector can be used for AC and DC operations with a rated current of 1.0 amperes and 50 Volts. It is applicable in both chassis wiring and power transmission wiring. The connector can be used with the wires of AWG within the range of #28 to #32. This applies to wire diameters as small as 0.2mm to 0.32mm. Fine wires such as these can help the routing job. Twin U-slot section or twinaxial cable has a pair of insulated conductors where the conductors are run parallel with one another. This is commonly used in high speed balanced-mode multiplexed transmission in large computer systems, in which the signals are carried by both conductors in a U-shaped configuration. This ensures reliable connection and provides greater noise immunity. For terminal purpose the available package offers 15,000 pcs per bag. 1.5 mm pitch serves as the best choice for densely crowded electronics systems for its small, square-edged configuration, ruggedized and shock resistant feature. The 1.5 mm Pitch connector can either stand as power contacts, signal contacts or both as power and signal contacts or a signal and grounding contact. The wiring harness interconnects the PCB to various components that sends signals and power to other electronic devices. 1.5mm pitch connectors ensures safety, system protection and performance with its bonded metallic conduits and multiple grounding points preventing fire hazards, component damage, overheating and possible electrocution. 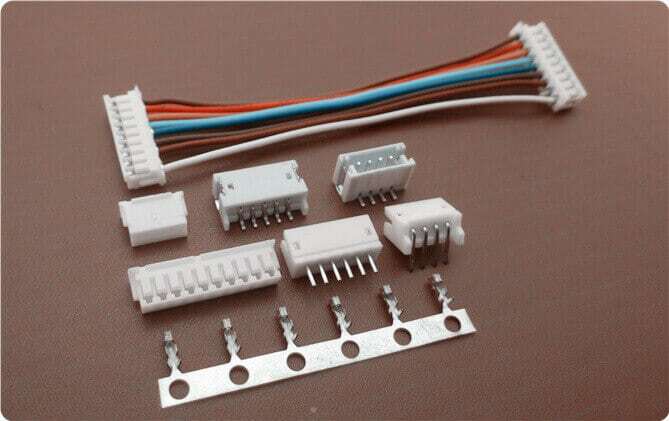 1.5mm pitch connectors find its popularity in Robot construction kit parts, robot sensor systems, micro controllers and power systems often found in educational institutions and laboratories. Even for hobbyists and enthusiasts, this is an important connector that is a must have. 1.5mm pitch connectors is also popular in batteries such as in rechargeable battery packs, battery balancers, battery eliminator circuits. Battery connections rely on the ability of the current to pass reliable and solid current. This prevents overheating in the circuit and voltage drop.